By clicking subscribe, you agree to receive access to the ebook and communications related to future ebooks and other recruitment resources. We believe that good software must be scalable for companies of all sizes. We pride ourselves in offering the very best customer support, 24/7. We are proud to be known as the most user-friendly software in the market. We are excited to be spearheading innovation in the recruitment tech sphere. "We’re crazy and obsessed with our hiring process, and Recruitee caters exactly to what we need - optimizing the shortest way to the best candidates." Sending out emails is a big part of a recruiter's day-to-day work. Ensuring smooth communication with your candidates if a must when aiming to hire the best people. 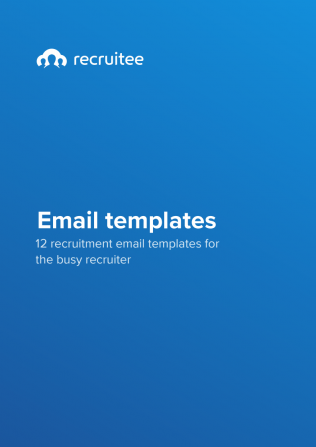 Download our free recruitment email templates now and save time on recruitment. Our templates can be used for every step within the hiring process.